Like last year, they've combined the Sarthe and Croix de Fer with an 105/Ultegra mix. The new 08 Lemonds seem to have better paint schemes. To me it looks as if they're continuing the weird pool hall look (which the Sarthe fortunately is not an example of). Nice! But the orange was so very sweet. i saw one at my lbs- very tempting. i liked last year's silver paint just as much! The Sarthe is a great bike and I really like the blue. If you like orange, ultegra and lugs, you might like this new bike from Kona called the Kapu. That's it daver42, exactly as pictured. Before I heard of the Sarthe, I was going to get a Soma but it was $275 more and no Ultegra parts. So glad I searched a bit more. My Sarthe is a triple. Last edited by knotty; 09-26-07 at 09:59 PM. I've been thinking (planning) on a Bianchi Eros, and then changed my (potential) loyalty to a 2008 Jamis Quest when I discovered that there's no more Bianchi steel in 2008. But the Jamis doesn't seem to be available and the Sarthe apparently is. Any thoughts about any of these? The new Quest will apparently have size specific tubing, which seems like a good thing, since I'm 210lbs. I'd like to be able to put a rack on and do some light (credit card) touring. I realize one should not obsess over the weights, but do we know what the weight of the Sarthe is? Is the Sarthe more race oriented, or more comfort oriented, than the Quest? The Sarthe is both racy and comfortable, but not in a touring sort of way. It has a relatively aggressive geometry and the TTOX tubing is not designed to carry a load, therefore no eyelets. On the other hand, the tubing is very comfy for longer rides. I came very close to buying one last year and decided on the carbon/steel frame instead. The quest seems like a nice bike too. There are no Jamis dealers where I live so I've never ridden one. Can't really compare to the Lemond. My guess is that the frame will be heavier, the geometry a bit more relaxed and the ride not quite as smooth. If you're dead set on touring, this might be worth waiting for. I love the paint schemes of the pre-trek lemonds. esp the 2001 Zurich. I'm always scanning ebay for one in my size. Yeah. My new Lemond is more Trek than Lemond and the decals are really cheesy. the sarthe has a "made in the usa" sticker on the seat tube, but we all know that means little these days. is it's steel frame made in the usa at the trek factory, or is it a taiwanese frame painted and assembled in the usa? i'm liking this bike more and more ( i'm stuck between this and a somewhat discounted 06 versailles), but no one in my area seems to have the sarthe in my size. The Versailles is nice, but don't pay more than $1100. The red ones were closeouts that were supposed to go for around $1000 at the end of last year. I don't like the blue at all. The Sarthe rocks though, definitely cool. 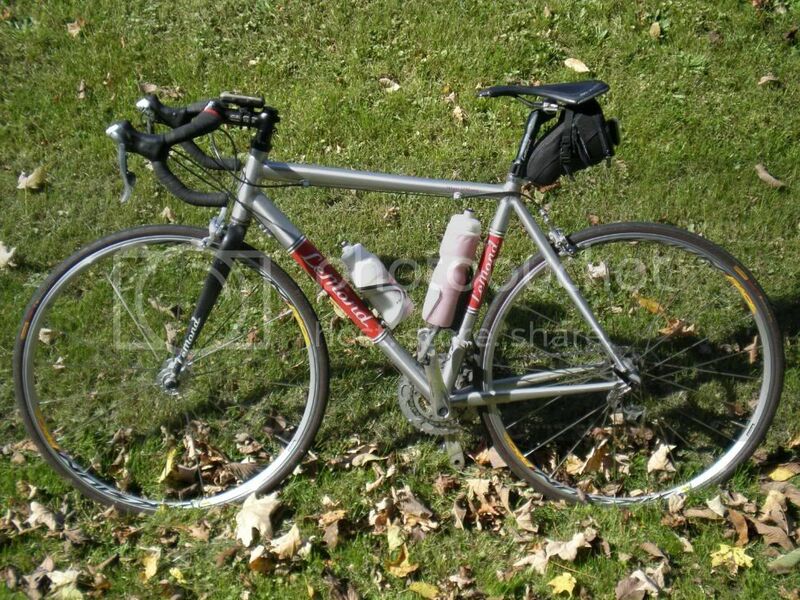 To straighten out a few Qs here, Trek licensed the LeMond line back in 1995 -- so lots of the admired "older" steel models were made by Trek. The steel bikes are built in Wisconsin and tigged up by real people, not bots, last I heard. Fine. Greg built 'em personally, by hand, in a little shop high up in the Colorado mountains. He gave away a bag of Greg's Best Coffee Beans with each sale, and the enterprise kept him too busy to ever shoot off his mouth about Lance Armstrong and doping. Then, [INSERT YEAR AFTER MODEL YEAR YOU LUST AFTER] Trek staged a hostile takeover and has ever-since been marketing re-labled BD Motobecanes as LeMonds. A sad state of affairs. Next years ride! (Replacing my '07 Victoire). I have the '06 Sarthe, jet black, I upgraded to full Ultegra and Race Lites. A Great Bike! Glad to see that Lemond is continuing to offer a steel framed bike, even if I'm not keen on the light blue colour. Bikes: 1980 Peugeot PKN10, '82 PSV10, '88PH10 and a 2002 LeMond Alp d'Huez. Seeing the 2008 LeMond bikes makes me glad my Alp d'Huez is a 2002 when their colour schemes were classically elegeant, as opposed to the new Trek/poolstick look. Does anyone notice on the newer Sarthes that the top tube slopes down toward the headtube? Why did Trek, after owning LeMond for years, suddenly start using their geometry on LeMonds? i have an '05 and have been happy with it, but i want to upgrade some of the parts. any advice on a new crankset. was thinking since most of the components are veloce i would go for that. would there be any other issues in regards to compatibility besides the bottom bracket? I don't like the light blue color scheme nearly as much as the yellow and shiny silver that was the '07. But of course, I'm not nearly OCP enough to get hung up on a color scheme. So there is a really good chance that the Sarthe will be my next bike. Just won't be the '08 as I won't be ready to buy until 2009 or 2010. How does the new Madone ride?